Comments: Launched by Marvel UK on 8th February 1978, Star Wars Weekly reprinted the US Star Wars title, alongside Marvel's other space-related/science fiction strips such as Warlock, Star-Lord, Micronauts, Tales of the Watcher, Guardians of the Galaxy, Killraven and Sword in the Star (from Marvel Preview). On May 28th 1980, the 118th issue of Star Wars Weekly began reprinting the Marvel US adaptation of The Empire Strikes Back and amended its cover title to reflect this. The last issue of Star Wars Weekly: The Empire Strikes Back was October 22nd 1980's #139, twenty two issues later. From November 1980 and #140, Star Wars Weekly: The Empire Strikes Back became a monthly comic, and thus dropped the "weekly" part of its title. This new title remained in place until #158 and June 1982; as of July 1982 and #159 Marvel UK simplified the title to just Star Wars. From #167 the comic also began reprinting Marvel US' adaptation of another Lucasfilm property, Raiders of the Lost Ark. 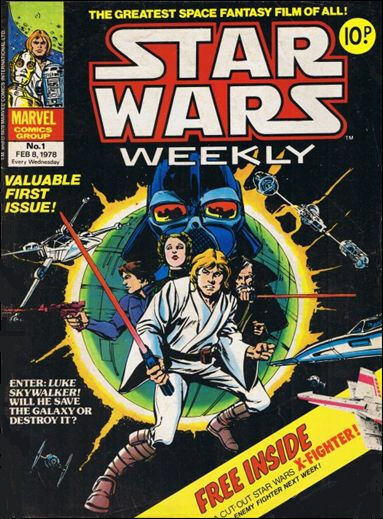 The comic continued under the name Star Wars until #171, cover dated July 1983 but presumably released the month before, as comics are generally forward-dated. That same month, June 1983, the title was relaunched as a weekly once more, this time retitled Return of the Jedi to tie in with the cinematic release of the latest Star Wars movie and the corresponding comic adaptation of same. The first issue of the retitled and renumbered series was cover dated 22 June 1983 and also reprinted Marvel's other Lucasfilm property - The Further Adventures of Indiana Jones as a back-up strip. This continued the adaptation of Raiders of the Lost Ark that had been started in the final issues of Star Wars. Indy would run for the first 22 issues before being replaced by an adaptation of Blade Runner, not a Lucasfilm property, but starring Harrison Ford, who played both Star Wars' Han Solo and Indiana Jones, and thus considered an appropriate substitute strip. Later issues saw the comic dip into Marvel's other movie adaptations, such as Time Bandits, Krull and For Your Eyes Only, and then, when those ran out, began reprinting Crystar, followed by Power Pack, a Marvel US strip with a tenuous space opera linkage. Meanwhile Marvel UK house robot C.Y.R.I.L. (who had been answering readers' letters since the comic's first incarnation), graduated to starring in his own one-page humour strip from issue 73. Originally written and illustrated by Steve Parkhouse before John Ridgway took over from issue 85.